Jane Hayes, a University of Maryland Extension Master Gardener and a member of the Howard County Master Gardener Compost Education Committee, answers questions about compost bins. 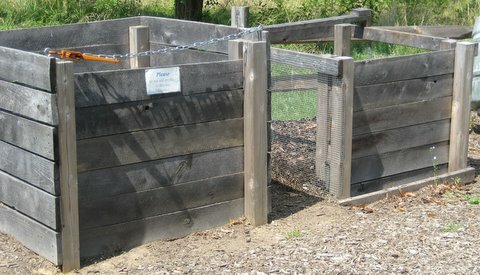 Is a composting bin necessary? Jane: You do not need a bin to compost. You can compost directly on the ground. The advantage of having a bin is that it looks neater and makes it easier to build the pile up to an amount that will generate heat to speed up the composting process. What are some different bin designs? Jane: Bins can be built from wood, wire, cement block, old shipping pallets, or almost any material that has not been chemically treated. A simple cylinder of heavy plastic with an open bottom and top makes an excellent composting bin. Enclosed bins are available commercially, some on stands for tumbling the compost, and some that can be rolled on the ground. Ideally, the dimensions of the bin are at least 3′ x 3′ x 3′, but not larger than 4′ x 4′ x 4′. What are the advantages and disadvantages of the different designs? Jane: Cost is one consideration. The plastic cylinders are inexpensive. In some jurisdictions they are available for free. Building your own bin takes some construction know-how but the result may blend more naturally into your yard. Pallets can be easily wired together to form an inexpensive, workable bin. Tumbling and rolling bins are usually quite expensive and often are not as effective as a simple open design. A good design lets in plenty of air, rain, and insects to help with the composting process. Closed bins require much more time and attention. Should I buy a tumbler? Jane: That’s a personal choice. Tumblers are expensive, but some people love them. If you use a tumbler you will have to add water because rain won’t get inside. 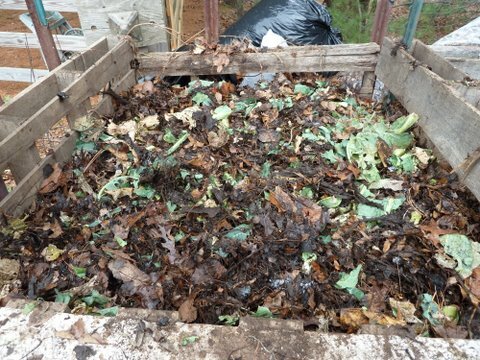 Few insects will get in to help break down the materials so you will have to turn the compost more often. Less air gets into a tumbler than an open bin, so there may be some odor during the composting process unless you turn the tumbler frequently. Where should I locate my bin? Jane: When considering location, think about how far you want to carry materials to the bin, where your water source is, where you will use your compost, whether there are covenants or regulations regarding composting for your neighborhood, and where the bin will not be an annoyance to your neighbors. You can collect fruit and vegetable scraps in a covered gallon-sized container in your kitchen to reduce the number of trips you need to make to the bin, or you can freeze your materials until you are ready to take them outside. Freezing also has the advantage of kick-starting the decomposition process. During dry periods you will need to water the compost. Carrying buckets of water any distance will probably discourage you from doing this often enough, so make sure you can reach the bin with a hose. If you plan to use your compost in the vegetable garden or in a specific area of your yard, placing the bins close by will make that job easier. Not everyone thinks compost bins are beautiful and some people may incorrectly think that a compost bin will attract rodents or other wildlife. Be considerate. Should the bin be in the sun or shade? Jane: One benefit of locating the bin in a sunny area is that a higher ambient temperature will increase the temperature in your bin, but only slightly. The bin will generally get more rain water in an open location than if sheltered by trees. The advantage of placing it in the shade is your own comfort when turning compost on a hot day, but there’s a major disadvantage to the shady location. Trees like the compost pile as much as other plants. Their roots will seek out the nutrients in the compost pile and will begin to grow there. That’s not good for the trees or your compost bin. 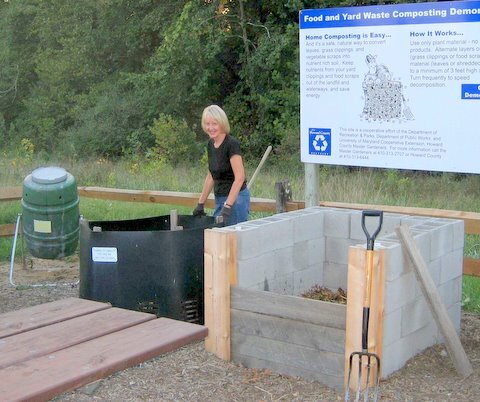 To link to the 2-page Howard County Master Gardener fact sheet about composting, CLICK HERE.